Inspired from the recipe by Spork Me. Photo By Spork Me. Optional: Cheddar Cheese for melting on top. Roast the mushrooms for about 10 minutes at 375F until they start to soften. In a heated and greased pan, crack eggs, top with pesto and cheese, being careful not to overflow the egg. Cook about 5-10 minutes, until the yolks are cooked to your liking. Serve on toast, with a bit more pesto on top. Cook your pasta according to package instructions (usually for about 12 minutes). Rinse the mushrooms well until all dirt is gone. If you are using dried porcini mushrooms, soak them in water for 15 minutes before you are ready to cook and use the soaking water for boiling your pasta to give it an extra flavor. Cut chanterelles in halves, slice white mushrooms and porcini (if using fresh ones. The dried ones are usually pre-sliced). Heat a tablespoon of butter over medium-high heat and sautée the mushrooms with sprigs of thyme and minced garlic until golden brown *about 5 minutes). Heat the remaining tablespoon of butter in a small saucepan and add flour. Stirring constantly, add cream or milk and cook until thickened, for about 3 minutes, adding grated parmesan, salt and black pepper in the end. Combine pasta, mushrooms and the béchamel sauce in one pan and add a bit of chopped parley. Enjoy! Trim off the beet greens and stems, peel the skin and wash, then cut the roots into 1 1/2-inch chunks. Place them on a cookie sheet and mix with a tablespoon of oil. Cover cookie sheet with a foil and roast for 45-60 minutes or until tender (when a fork slides in a piece easily). Remove from the oven and let cool. Leave the oven heated. 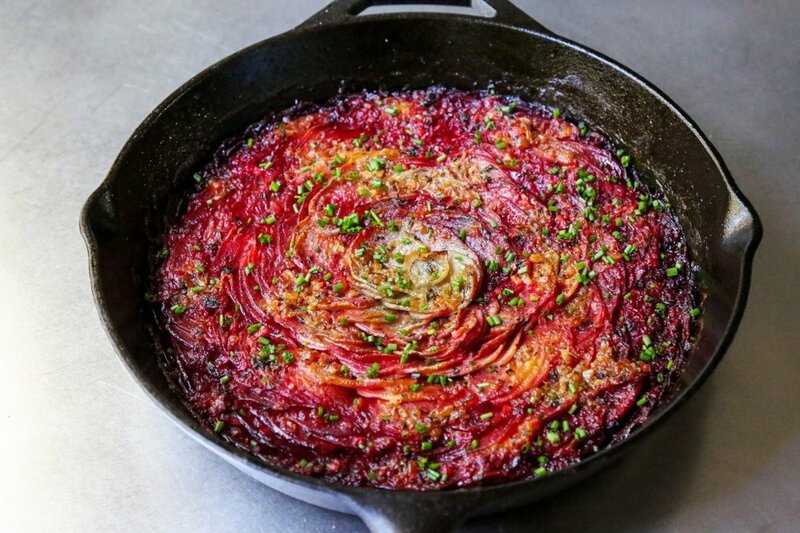 Once puree has cooled, place roasted beets in a food processor and process until you get a puree consistency. Pour the puree into a bowl and measure out 3/4 cup. Store the remainder. Pour the measured out puree back into the food processor. Add the coconut oil, vanilla extract and flax seeds. Puree some more. Transfer to a large mixing bowl and mix in sugar and stir until well-combined. In a separate, medium-sized mixing bowl, whisk together the flour, baking powder, and salt. Add a third of the wet ingredients and mix gently for two or three strokes, add a third more and repeat. When all the wet ingredients are mixed in, fold in the nuts and chocolate chunks. Scoop the batter into a pan and flatten the top with a spatula. Bake for 25-30 minutes, or until the top is glossy and a toothpick comes out fairly clean (no goopiness but little brownie bits are fine). slice the beets very thinly - as thin as you can manage with a knife. If you have a mandolin, this is the time to use it. in a bowl, drizzle with olive oil, fresh ground pepper, kosher salt and fresh or dried rosemary to taste. roast for 15 minutes - the beet edges should be starting to brown and pull away from the baking sheet - they may start to curl but that's ok.
from the 15 minute mark on, check the beets every few minutes as they brown and crisp up - they can burn very easily and quickly so you'll want to walk that fine line between perfectly crispy and burnt. The thickness of your beet slices will impact how long they cook. Enjoy! In a small bowl, mix together brown sugar, smoked paprika, paprika, chili powder, garlic and olive oil. Spread evenly on top of salmon. Place salmon pieces on an oiled foil-lined baking sheet. Drizzle juice from lemon on top of all salmon. Bake at 425°F for about 12-15 minutes, until cooked through. Recommended: Add the basil pesto included in the Omnivore Package! Heat oven to 425°. Roll 16-oz whole-wheat pizza dough onto a baking sheet coated with vegetable oil cooking spray, brush with 1 tsp olive oil, and bake until dough begins to brown, 6 minutes. In a medium skillet over medium-high heat, heat 1/2 tbsp olive oil; sauté 1 sliced yellow onion, stirring occasionally, until soft, 5 minutes. Reduce heat to medium, add 1/4 tsp kosher salt, and cook until onions turn dark brown and caramelize, stirring occasionally, 20 minutes; set aside. In the same pan over medium-high heat, sauté 2 cups sliced white mushrooms in 1 tsp olive oil until soft, 5 minutes. Return onions to pan, stir and remove from heat. Spread onion mixture over pizza dough, leaving a 1/2-inch border. Bake until dough is golden brown, 9 minutes. Serve topped with 2 cups arugula drizzled with 1 tsp olive oil and seasoned with black pepper, and 1/2 cup crumbled goat cheese. Preheat the oven to 400°F. Grease a 12-inch cast iron skillet with 1 tablespoon of butter. Working from the outside in, tile sliced beets and turnips in a rosette pattern. I started with red beets on the outer edge, then gold, turnips, and chioggia. If you don't want to fuss with all of that, check out the note above. Warm 3 tablespoons of butter in a small skillet set over medium heat. Add shallots and cook until soft, stirring frequently (about 4 minutes). Add the garlic and thyme and cook, stirring constantly, for 1 minute more. Take the pan off the heat, and stir in the remaining 5 tablespoons of butter. Once the butter is melted and incorporated, season to taste with kosher salt and freshly ground black pepper. Pour the butter-garlic mixture evenly over the prepared beets and turnips, then pour over the chicken stock. Cover the skillet tightly with foil, then bake in the oven for 45 minutes. Remove the foil and cook until the top of the gratin is just starting to brown and get crispy (about 30 minutes). Let the gratin cool for 30 minutes. Sprinkle with chopped chive just before serving. In a bowl combine the basil pesto, softened butter, and zested garlic using a fork. scoop and place 2 scoops on each fillet. Preheat your oven to 400 degrees Fahrenheit and bake for 10 minutes. Roast the vegetables: Preheat oven to 425 degrees Fahrenheit. Toss the chopped potatoes and carrots in 2 tablespoons olive oil and arrange them in a single layer on a large, rimmed baking sheet. Bake for 30 to 35 minutes, tossing halfway, until the vegetables are tender and golden. Cook the lentils: In a medium saucepan, bring the broth (or water) to boil and add lentils. Cover, reduce heat and simmer for 30 to 35 minutes, until tender. Drain the lentils, return to pot, remove bay leaf and cover. Assemble the dish: In a large serving bowl, toss together the lentils, vegetables and sauce. Season with black pepper and salt to taste (miso is salty so you might not need much or any salt). Serve. Preheat oven to 425 degrees F. Line half sheet pan with parchment paper. Roll out pastry on lightly floured surface to 11x11-inch square. Using a sharp paring knife, gently score a 1/2" border, carefully cutting halfway through the pastry. Brush lightly with egg wash on the border and bake for 10 minutes. Meanwhile, in a large skillet over medium-high heat add 1 tbsp olive oil, carrots and 1/2 tsp salt. Sauté for 10 minutes until edges become golden brown. Add 1 tbsp vegetable stock and cover for 5 minutes. Simultaneously in another large skillet over medium heat melt 2 tbsp butter and sauté onions. Stir ocassionally. Add 2 tbsp stock, 1/2 tsp salt, 1/2 tsp pepper and cook for 2 minutes until moisture is absorbed. Since pastry will be puffed up, gently press with fingers to flatten the center area leaving the border raised. Sprinkle cheese evenly all over center, then evenly layer onions and lastly, spread out the carrots. Lightly drizzle with olive oil and bake for 15 minutes. Woodsy mushrooms and tangy Taleggio, a buttery Italian cheese, contrast deliciously with crisp roasted potatoes. Bake the ingredients in two dishes so you can have one at each end of the table--people may not want to share. Many mushroom varieties work well in this dish, including hon shimeji (brown beech), chanterelle, oyster, and cremini. Preheat oven to 400 degrees. Toss mushrooms with 4 teaspoons oil and 1/2 teaspoon salt. Season with pepper. Toss with sage and garlic. Spread on a rimmed baking sheet, and roast until mushrooms are golden brown and tender, about 15 minutes. Toss potatoes with remaining 5 teaspoons oil and 3/4 teaspoon salt. Season with pepper. Divide potatoes between 2 rimmed baking sheets, spreading in an even layer. Roast, rotating pans halfway through (tossing if browning too quickly), until dark golden brown and crisp, 35 to 40 minutes. Preheat broiler with rack 6 inches from heat source. Toss together mushrooms and potatoes, and divide evenly between two 5-by-7-inch oval baking dishes. Top each with Taleggio, and broil until cheese melts and is pale golden, 2 to 3 minutes. *Omnivores: Use the Basil Pesto in this week's basket! In a dry skillet, lightly toast pine nuts. Set aside and let cool slightly. In a food processor, pulse garlic. Add in basil, toasted pine nuts, parmesan cheese, olive oil, and lemon juice. Pulse until combined, adding more olive oil/lemon juice as needed. In a sauce pan, bring water to a boil with a pinch of salt. Add sliced potatoes and cook until just tender but not overly soft, 3 to 5 minutes. Drain and set aside. In an 8" or 10" skillet with a lid, heat olive oil over medium heat. Add in onion and cook until softened, 3-4 minutes. Stir in sliced potatoes, reduce heat to medium low, and cook until browning, 6 to 8 minutes. Add in 1-4 -1/3 cup pesto, stirring until potatoes are covered. Make well in the middle of cooked potatoes and crack desired amount of eggs, cover, and let cook until egg whites are set. Remove from heat, sprinkle with extra parmesan cheese, and serve. Notes: I love fingerling potatoes but sometimes they aren't available or are a bit more expensive. I'll occasionally use yukon gold potatoes, cut into similar half-moon sizes. Photo and Recipe by Kate Merker in realsimple.com on April 2009. Adapted for Intervale Food Hub members.